France is the world’s 5th largest-market for medical devices, estimated at over 19 billion Euros and ranked at 11th in the world for public health expenditure per capita. These figures indicate great market potential for foreign companies in medical innovation wishing to tap the French market. Medical innovation is borderless and we all share healthcare issues Many companies, especially small and medium-sized enterprises, face difficulties in penetrating the French market, particulatory in terms of regulatory and cultural obstacles. Indeed, France is ranked 38th worldwide out of 183 countries in the ease-of-doing business index. However, such obstacles can be overcome. Once a new technology has been approved through clinical trials, interviewing opinion leaders and working with the relevant supervisory and regulatory bodies, the potential of the French market opens up and all actors can benefit from these innovations. 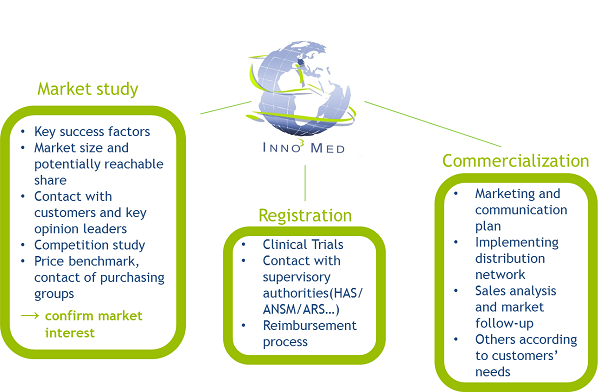 The role of Inno3Med is to build the necessary links between the different stakeholders in order to ensure a controlled and efficient expansion of innovative medical technologies.